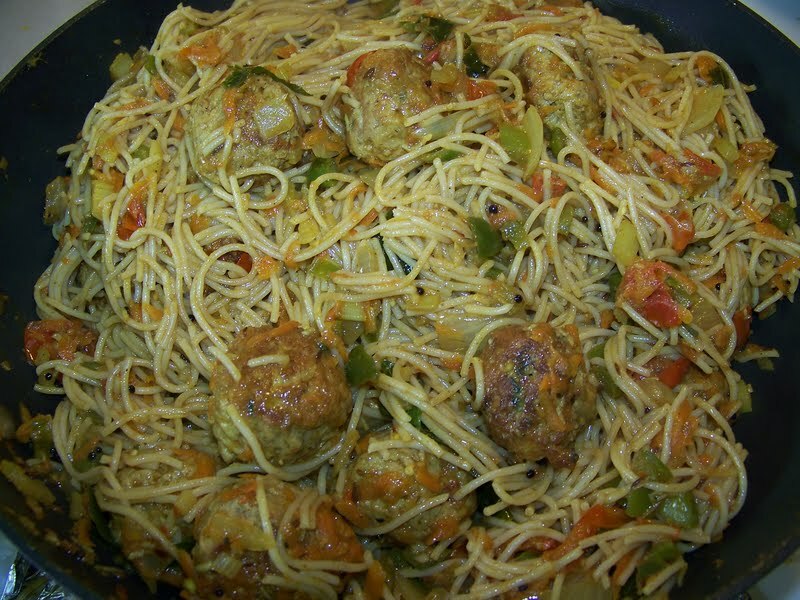 I love spaghetti and meatballs. But sometimes you just have to switch things up. 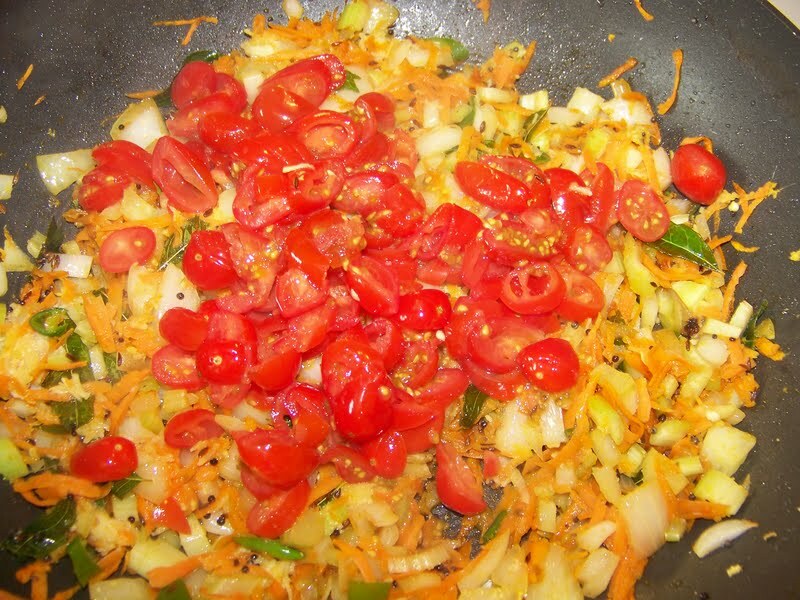 So I decided not to make my traditional Italian tomato based spaghetti and opted for a spicy Indian Masala Spaghetti. I am so glad I took a chance because it came out fantastic. If you like a little bit of heat and spices that make your tastebuds dance try a this new Masala Spaghetti. Mix all ingredients well and make into desired size meatballs. Fry in about 2Tbs of olive oil on medium high heat. 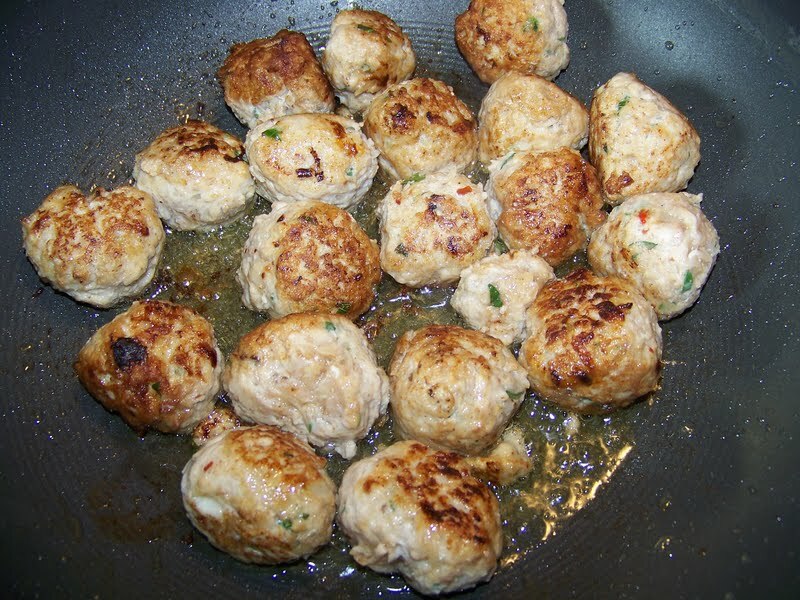 Once meatballs are browned, transfer to a plate and set aside until they are finished off in the sauce. Reserve the oil from frying the meatballs in the pan to make the sauce. Note: Before cooking the sauce cook your spaghetti pasta (I recommend thin spaghetti) until is is al dente. Heat the oil leftover from frying the meatballs on medium-high heat. 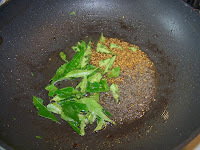 Add the torn curry leaves, cumin seeds and mustard seeds. Allow to fry for 30-45 seconds. 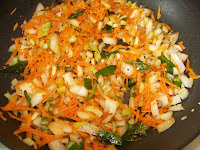 Next add the the onions, celery, carrots and chilies in the pan and fry for 3-4 minutes. 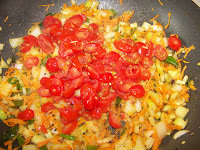 Then add your diced tomatoes and fry for another 2 minutes. 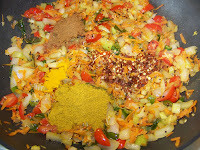 Now add your ground spices (curry powder, garam masala, tuermic and chili flakes). Fry for anther minute. 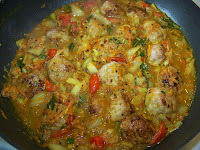 Add the chicken stock and and meatballs back into the pan to finish cooking. 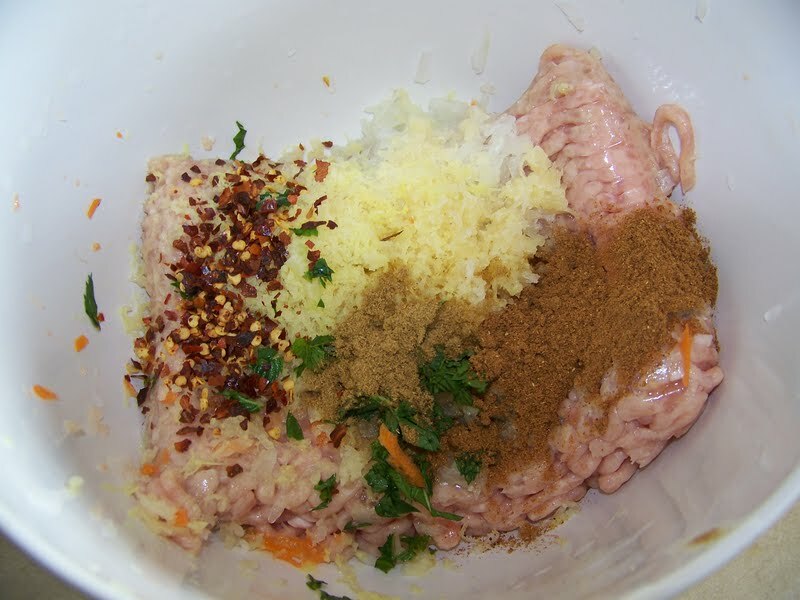 Cook for 7-10 minutes and taste for seasoning. 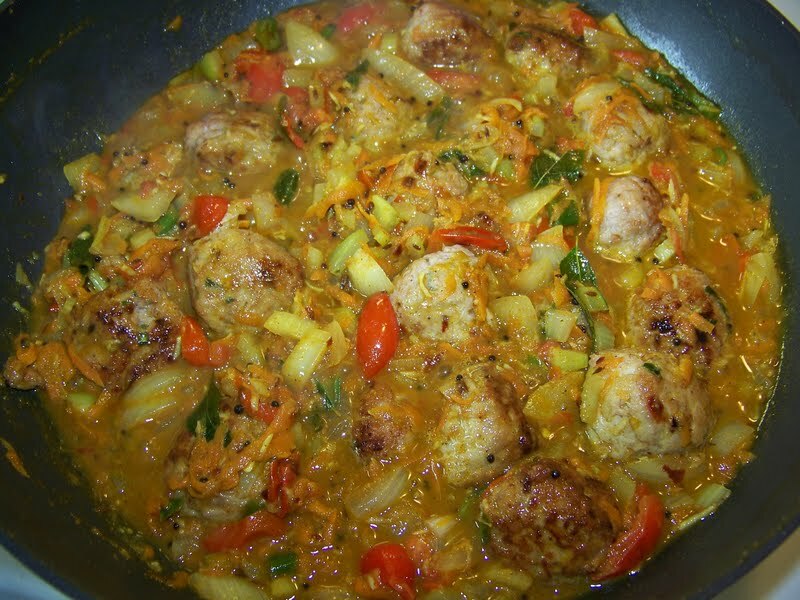 Add your cooked pasta to the pan and toss well with the sauce and meatballs. Serve immediately. Serves 4-6 people. Enjoy. Garnish with fresh parsley or cilantro. You can also eat it with some cool cucumber raita. 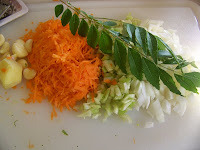 I am suppose to make curry tomorrow. And I am unsure how so I am cruising around your site tomorrow for ideas for sure. This looks absolutely wonderful. This looks amazing! 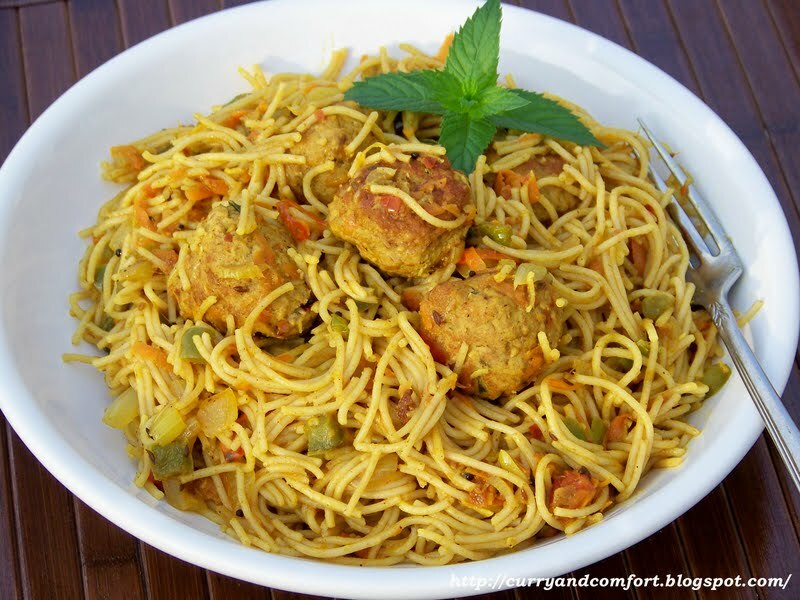 I love the idea of a curry style spaghetti and meatballs! I'm with Lizzy - can I come over and have some? I LOVE this pasta dish - combining two of my favorite flavors. Looks so comforting, too. That sounds delicious and what a combination thanks for that share, great job! Oh this looks so good, I have never been a fan of spaghetti and meatballs... but I think you have changed my mind! Great idea!! 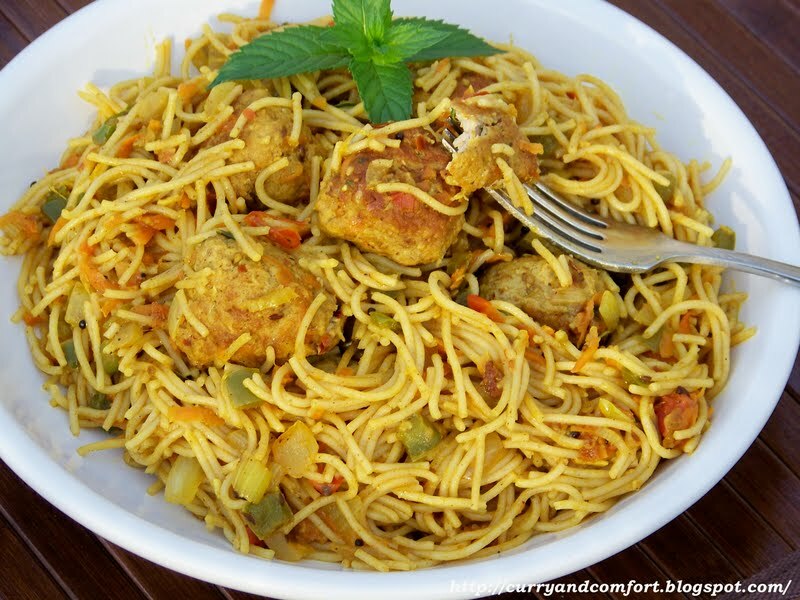 I love pasta and indian flavors so I'm sure I'd eat this right up! I heart how you switched this up! What a great idea! This looks so good! 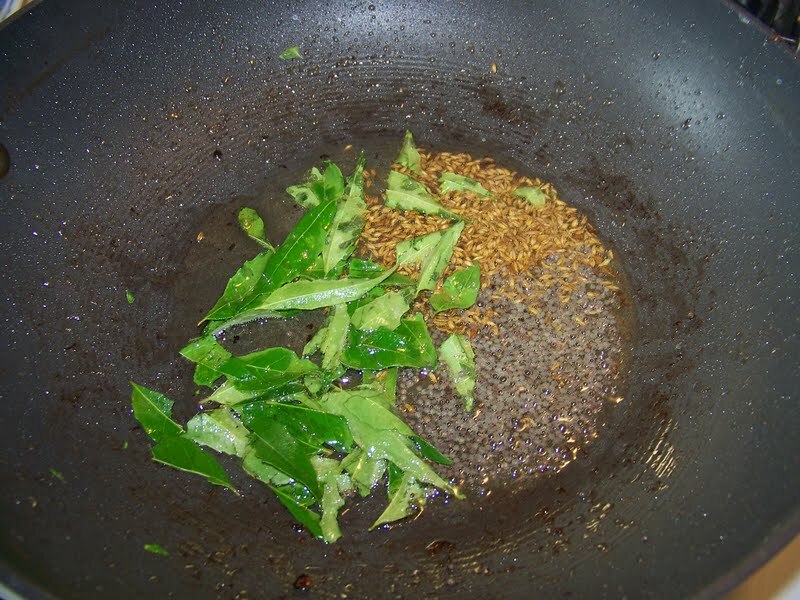 I don't know where do get Curry Leaves. Is there something else I could use? 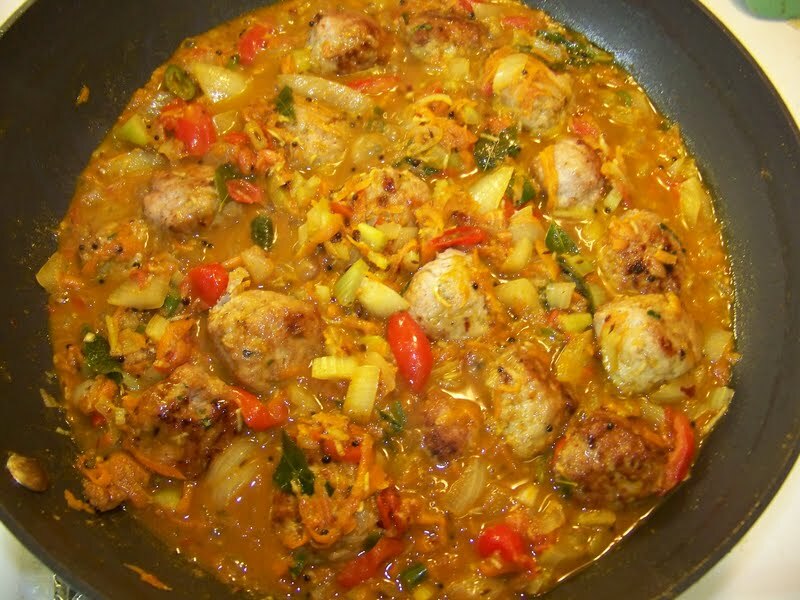 It looks Yummy..Thanks for sharing the Recipe. Tried and Tested - Looked and Tasted yummy. Thanks for your recipe. very innovative!